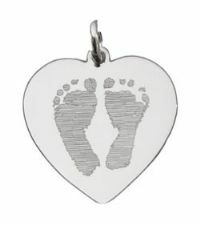 Our sterling silver large heart charm is custom engraved with your child's actual handprint and footprint images for a truly one of a kind personalized keepsake. 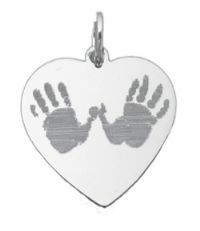 Have your child's 1-2 handprints or 1-2 footprints engraved on a large heart charm, select image to be engraved in the drop down box below. Looks beautiful as a necklace, select chain and birthstone gem options below. On the back, you can engrave up to�4 lines. The first line of personalization is included in the price. Fill out engraving fields below. "We got the custom heart charms and dog tag today and we love them! Thanks so much for doing such a wonderful job and a wonderful service for families that have suffered such tragedy! We will forever look at the bracelet & keychain and smile in our hearts that we have such a beautiful remembrance of our precious twin girls. ~Susie L."